Gagosian is pleased to present Primary Sources, an exhibition of works by the late Richard Artschwager. This is the first time that key paintings and drawings will be shown with materials from the artist’s personal archive, spanning the 1960s to his death in 2013. For five decades, Artschwager forged a maverick path by confounding the traditional limits of art and reconfiguring the visual comprehension of space. Associated with many genres but cleaving to none, Artschwager’s art has been variously described as Pop, Minimal, and Conceptual. Focusing on the structures of perception, his work conflates the visual world of images (painting) and the tactile world of objects (sculpture), with inspirations ranging from counterintelligence to cabinetry. Synthetic materials were critical to Artschwager’s project. 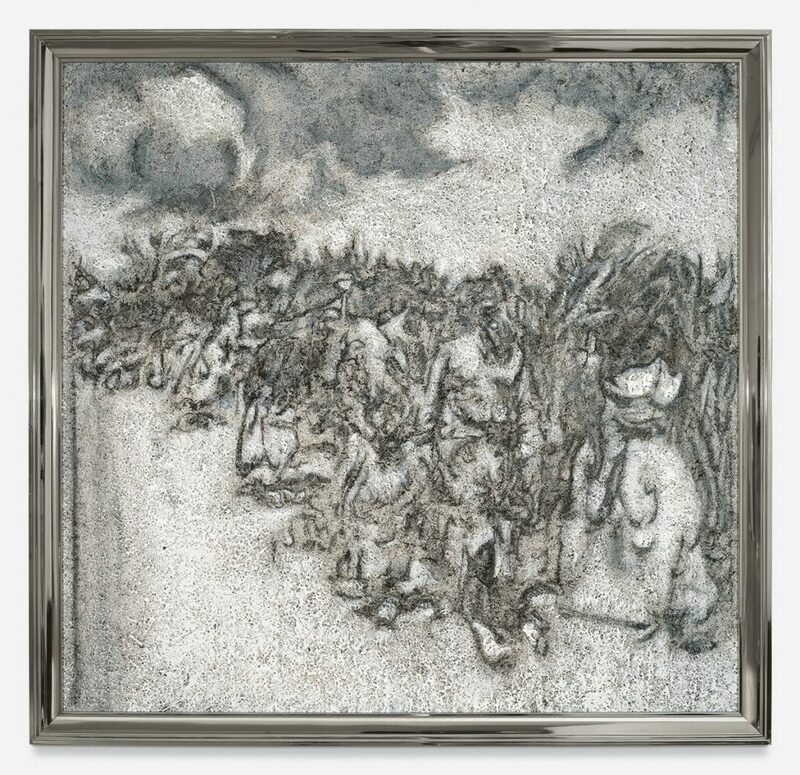 He worked frequently with Celotex, a heavily textured, obdurate compound board that allows brushstrokes to remain palpable, producing grisaille paintings of images both topical and obscure, from newspaper photographs to landscapes and interiors. Artschwager often painted from photographs culled from the daily newspapers. Tank (1991), based on an image from the New York Times, depicts an M-1 tank on a roadside but leaves ambiguous the role of a figure in the foreground, back to the viewer: ally or target. Newsprint reproduction blurs photographs, so Artschwager developed a grid system to enlarge the image, allowing him to reinvent obscured details. Ten feet in length, the scale of Tank adds to the ominous drama of the image. In Artschwager’s representations, images originally published for informational or documentary purposes gain a surreal quality with infinite narrative and compositional possibilities. Arizona (2002) depicts the sinking of the USS Arizona in Pearl Harbor, 1941. Artschwager painted it from an image reproduced in the July 27, 2002, issue of the New York Times, accompanying an article that compared the United States’s lack of military preparedness in the bombing of Pearl Harbor to the terrorist attack of 9/11—an event from which the country was still reeling at the time. Dark and elegiac, the literal aspects of the image with its doomed battleship are lost in texture and haze, recalling romantic seascapes by Turner as much as historical illustrations of war. Artschwager’s 1969 interpretation of Tintoretto’s The Rescue of the Body of St. Mark (1562­–66) reads like an architectural plan, divested of the brilliant colors and cast of characters of the original. The figures become geometric shapes, or “blps”— the lozenge-shaped forms he made to function as conceptual focal points. Positioned to demonstrate the foreshortening of the original painting’s perspective, they function as an abstract signifier of human presence, with the only remaining figurative part of the work a depiction of St. Mark’s hand. In typical Artschwager style, the rational yet radical dissection of what we experience in an image provides an emotional and psychological filter, while also reflecting on the political and social moods through which Artschwager himself lived.